This year I introduced an action mascot and slogan as a part of our focus on action FOR and FROM learning. Meet Care Bear. Care Bear arrived at our first assembly and shared the story, “Have You Filled A Bucket Today?” Care Bear then challenged all of our students to a year of showing caring through daily acts of caring and kindness. 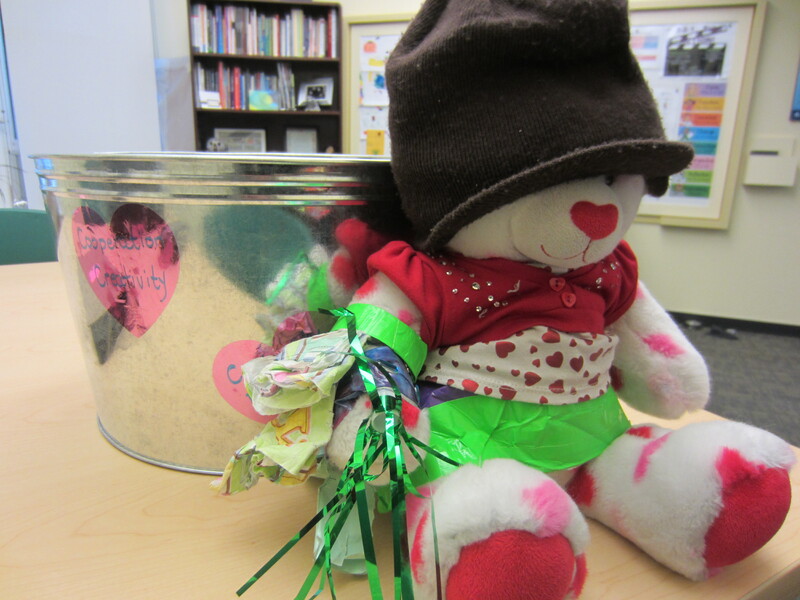 Care Bear invited students to fill her bucket with hearts all year. Care Bear’s big silver bucket is in a location that is accessible to all students. Students are encouraged to record daily acts of caring that are done to them or that they observe on pink hearts and drop them in Care Bear’s bucket. Each week at assembly during our weekly action update, Care Bear shares hearts from her bucket to honour daily acts of caring and kindness. Acts of kindess range from: including friends in games and play, holding doors for others, sharing supplies, giving hugs, telling jokes to make others laugh, helping to clean up, etc. Care Bear and her bucket. 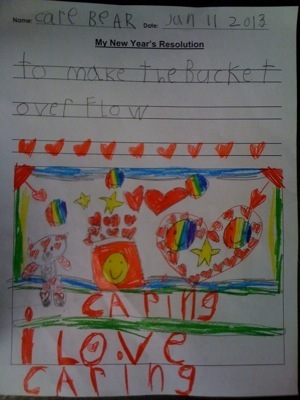 Care Bear’s Bucket is filling with hearts! and one of them announced, “You’re not filling my bucket. We need to be more caring!” Much to his surprise, the argument stopped and they moved on to something more positive. The way that students are embracing Care Bear’s challenge far exceeds my initial vision. Care Bear has garnered rock star status at our school – no doubt because caring ROCKS!! !